Cut florets off cauliflower head, then cut into small bite size pieces. Boil in salted water for 5 minutes and drain. 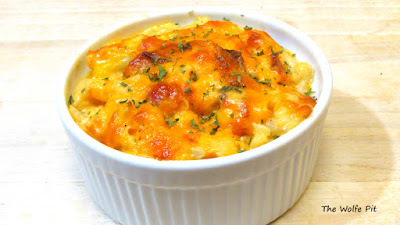 In a small pan over medium heat add cream, cream cheese and 1 1/2 cup of the cheddar cheese and bring to a light boil. Stir until cheese is all melted and well combined. Turn the heat off and mix in the crumbled bacon. Combine the cheese sauce and cauliflower, mix until well combined. Pour cheese and cauliflower into an 8x8" greased casserole dish. Top with remaining 1/2 cup cheddar cheese. Bake in a 375º for 25-30 minutes or until the cauliflower is for tender, the sauce is slightly reduced and the cheese is golden brown and bubbly. Let rest for 15 minutes to thicken before serving. I made this with cubed ham and onions instead of bacon and it was great!!! Nice additions Brenda! Thank you for watching and giving it a try! How many servings does this make and what is a serving size? how do you print the recipes? Right click in the body of the recipe, then select print.